Unlike traditional acrylic overlays, which can be filled, acrylic dip over natural nails is usually removed completely at each and every appointment—and that means more opportunities for natural nail damage through improper removal. Since acrylic dip’s popularity shows no signs of stopping, techs can expect to spend more and more of their time on this arguably risky (and let’s admit it, not very fun) task. 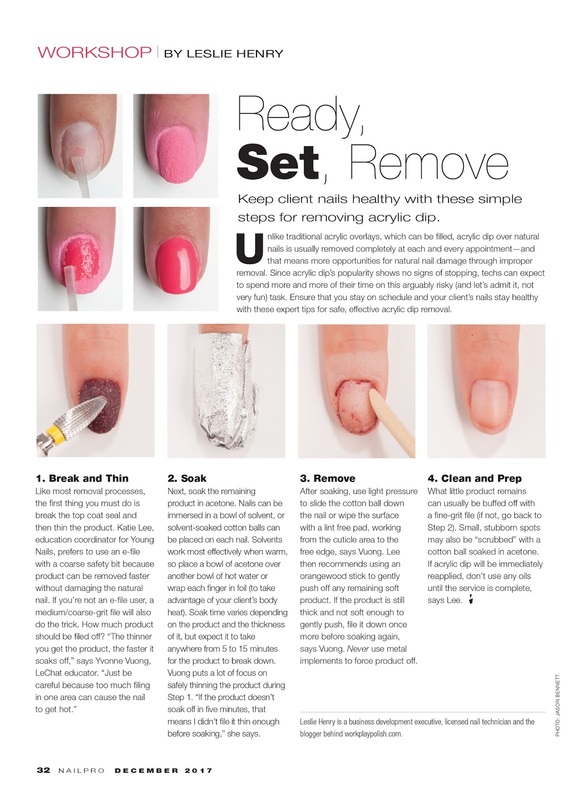 Ensure that you stay on schedule and your client’s nails stay healthy with expert tips from LeChat educator, Yvonne Vuong, and Young Nails education coordinator, Katie Lee, for safe, effective acrylic dip removal.